There’s something about Bangkok. One minute you hate it and you’re tired of its smog, noise and chaos and then next moment you are visiting one of the temples, or one of its markets, and you are totally in love with the city. 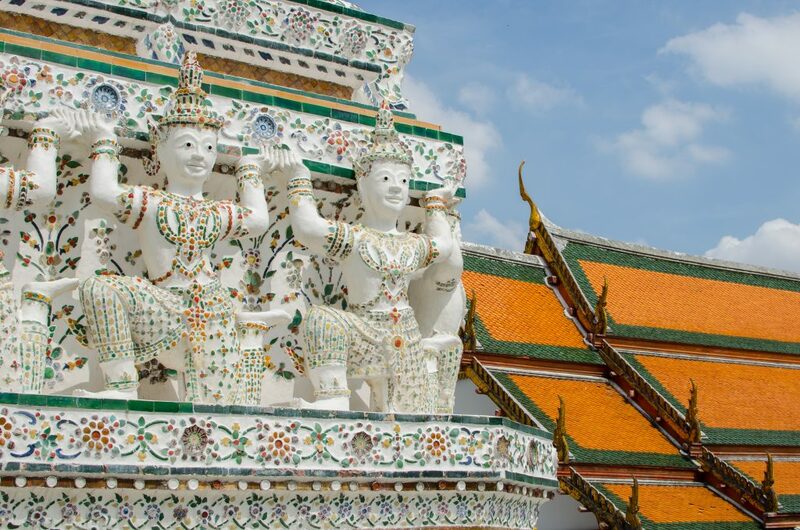 I have visited the Grand Palace, Wat Pho and Wat Arun in Bangkok many times and each time I am totally mesmerised by the richness of the architecture and the beauty of the sites. Despite the crowds I always enjoy my visits there. I even have my little walking tour around the area and I like taking my friends there whenever they want me to show them around. This time wasn’t any different. Chris and I arrived to Bangkok in the late afternoon. 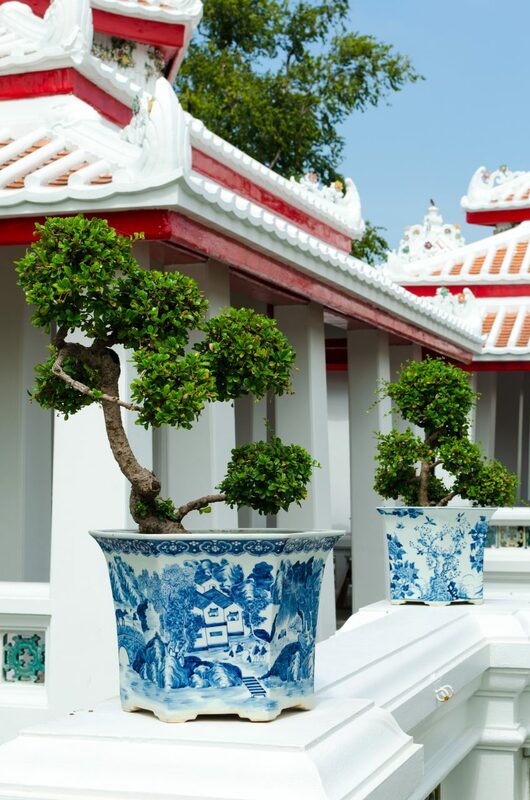 We checked in to our hotel on Rambuttri – one of my favourite touristy streets in Asia. It’s just next to Kao San Road, but it’s much quieter and suits couples and families much more than its hectic neighbour. Sleep Withinn, the hotel we stayed in was relatively cheap, considering the location, but the room was small and it was hard for us to move around. However, the fact we had a pool and I could use it once a day made me feel much better about our stay there. The next day we set off on our sightseeing tour. 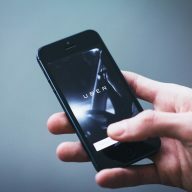 Luckily, I already knew my way around and we didn’t have to waste money on taxis. We just took an express boat. 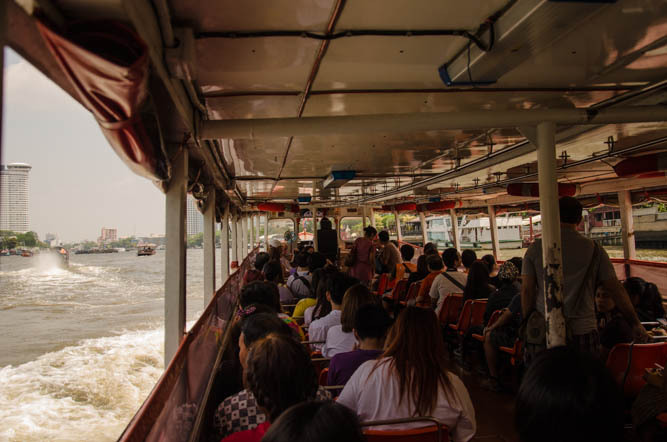 Express boats in Bangkok, cruising the Chao Phraya River, are one of a kind such transport system in the world. 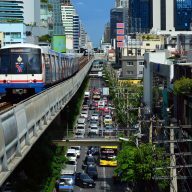 They act as trams and can take you to a lot of places in the city from where you can take BTS (a fast, metro-like train, also called Sky Train), or visit any of the major attractions. 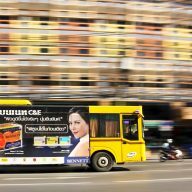 You can either take a tourist one (40 Baht one way, or 150 Baht for a whole day), or ask for the non-tourist option (15 Baht one way). I always take the latter. It might be a little overcrowded sometimes, but it gives you a true insight into the local life. 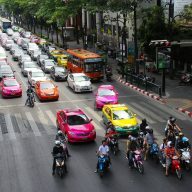 The problem with transportation in Bangkok is that almost all of the information is in Thai and only the more expensive, tourist options are in English. However, you can always ask the staff working on the pier. Quite often they don’t speak much English, but they will understand enough to point you in the right direction. 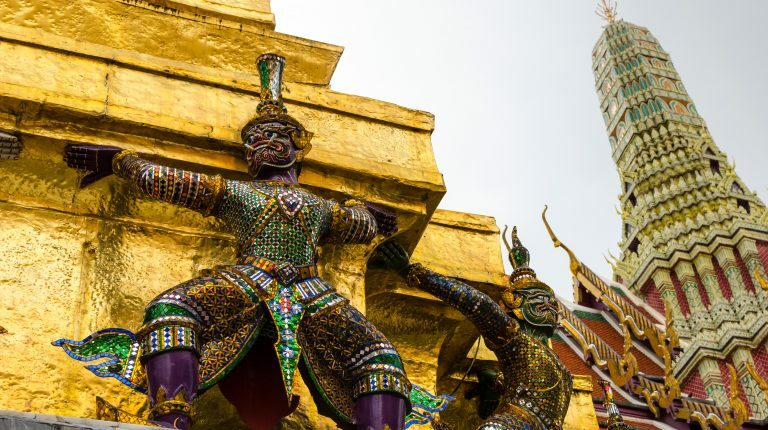 Just around the corner from Rambuttri you will find the Phra Athit pier, from where you can catch a boat to places like the Grand Palace, Wat Pho and Wat Arun in Bangkok. We got off at the pier number 9, which is just next to the Palace. After passing of the beloved by Thais King Bhumibol the area around the pier has been cleared and the street stalls with souvenirs and food have been moved. Due to a huge number of visitors paying their respects to their monarch the Palace is now surrounded by guards and security checkpoints. 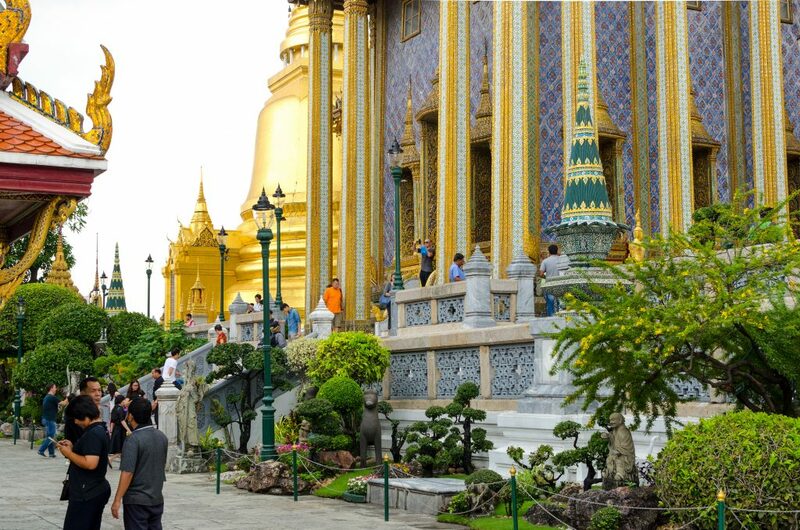 Before you enter the Grand Palace in Bangkok you need to go through a bag search. Here you will need your ID. If you travel with a group only one person needs the document. Sometimes they let people in without it, but it’s better to have it, just in case you stumble upon a stubborn security guard. Then you go through a metal detector and a bag search. Remember to dress appropriately – women can wear long trousers, a skirt or a dress (they should be long, or at least down to your knees) and a top that covers their shoulders. Men need to wear long pants. Even if you have long shorts it won’t be enough. Men should also cover their shoulders. Covered shoes are recommended, but not required. If you are not wearing appropriate clothing, don’t worry. You can rent everything in a building just next to the main entrance. Deposit is 200 Baht. Now, you need to go through another security checkpoint and another bag search. A ticket booth is located around 100 metres from there. Entrance is 500 Baht. Chris didn’t have long pants with him, so we had to stand in a long queue for him to rent a pair of trousers. After we finally bought the ticket we were already a little tired. Despite the heat and thousands of people I thought that the Palace and the temples were stunning. It all shimmered with gold in the sun. It was hard for me to capture the beauty of it. You really do need to go and see it for yourself. The architecture here will blow you away. You can spend a whole day here, exploring this large area. 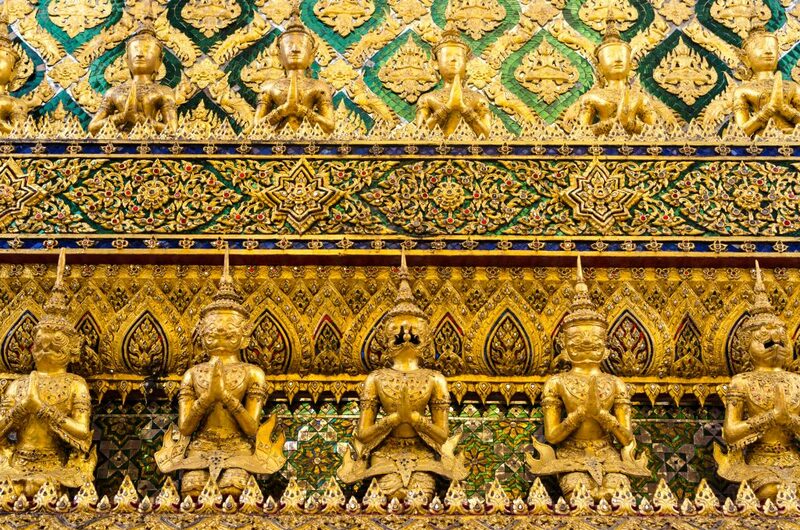 Next on our list was Wat Pho – the temple of Reclining Buddha. It is located just next to the Palace. Sometimes, when I take my friends, who have never been to Thailand before, with me I negotiate a tuk-tuk ride from the Palace to Wat Pho. It is a very short drive, but it’s always so much fun for everyone, especially when you have to squeeze in a few people into a tiny tuk-tuk. 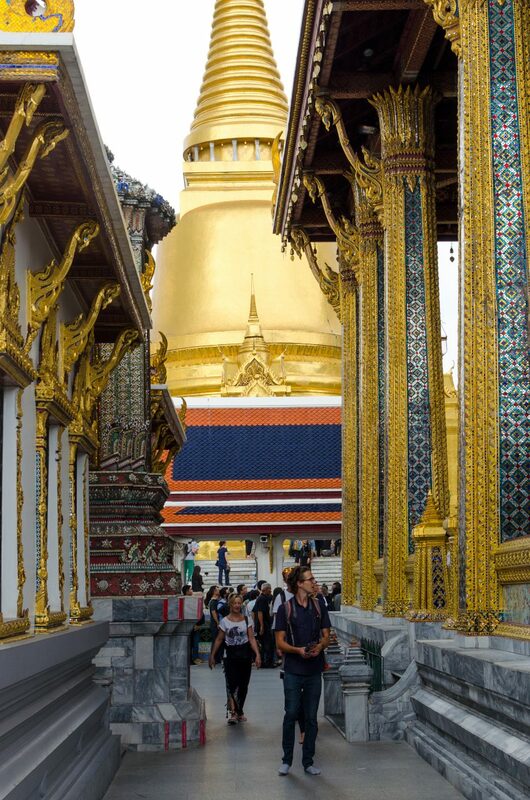 This time we skipped this part and just walked to the Wat Pho’s gates. Here you also need to have appropriate clothing. 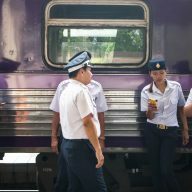 However, the guards are not as strict as those at the Palace and longer shorts and skirts are allowed. Just cover your shoulders and you will be good to go. Again, you can rent skirts and trousers here, too. The entrance to the temple is 100 Baht per person. 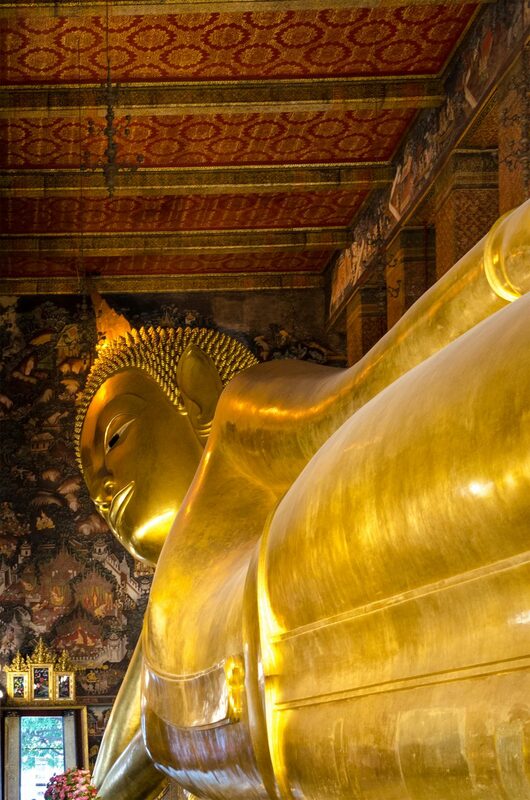 Wat Pho in Bangkok has over a thousand of Buddha images, but the main attraction is the Reclining Buddha, which is 160 feet long. The site was as crowed as ever, but we managed to find a few quiet spots. I didn’t expect to stay there for so long, but it’s a really great place that has hidden corners and lovely colourful jedis. 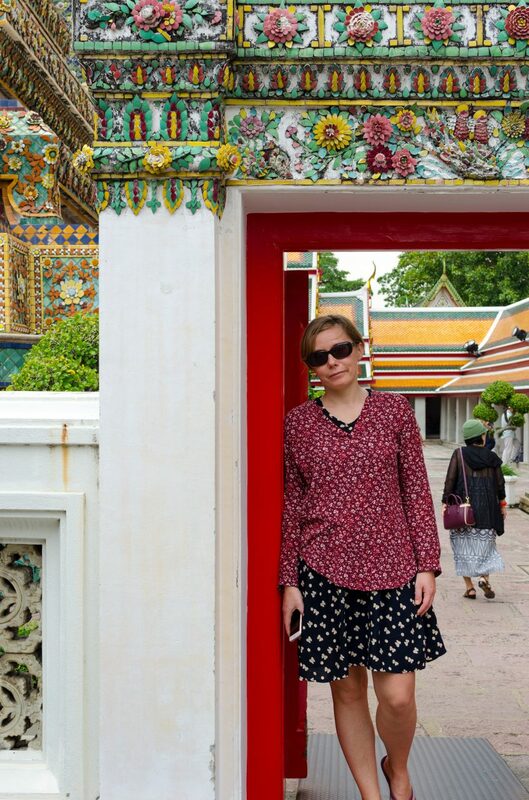 Finally, the time came for one of my favourite sites in Bangkok – Wat Arun. From Wat Pho we took a boat for 3 Baht to cross the river. I was a little disappointed as it turned out that the temple was under construction and we couldn’t climb the steep steps of the main building. 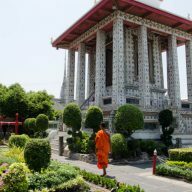 However, Wat Arun in Bangkok is surrounded by beautiful gardens, so we took a stroll around. The entrance is 40 Baht and you also need to wear decent clothing to enter. The gate with the two giant statues makes for a really good photo op! The gardens around Wat Arun are stunning. We got back to our hotel by the express boat and finished our day with a cold beer and a delicious pad thai in small street stall just outside of our hotel and a cool dip in our swimming pool. 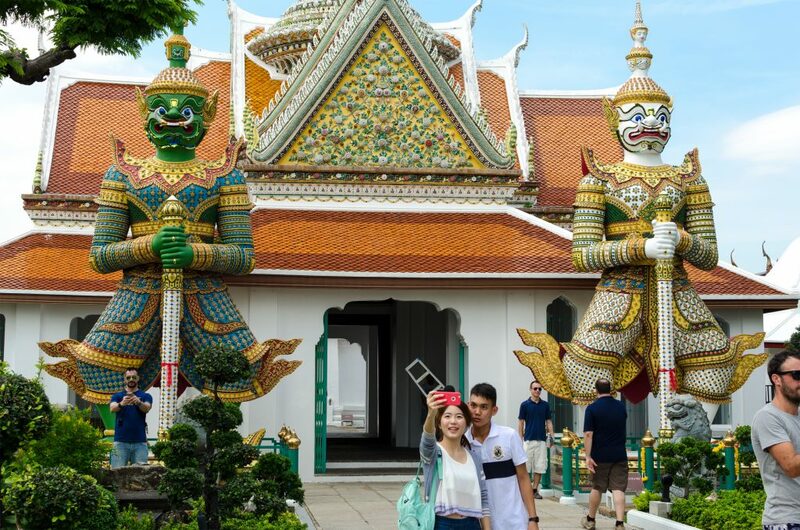 The Grand Palace, Wat Pho and Wat Arun in Bangkok are very touristy sites and are often overcrowded. However, you cannot miss them when you are in the city for the first time. They are must see for every visitor.